Siam Kyudo Kai: 4th Asia Oceania Seminar and Chuo Shinsa! 4th Asia Oceania Seminar and Chuo Shinsa! The schedule of 4th Asia-Oceania Kyudo seminar and Chu Shinsa is now released. Scheduled time is from 8 to 17 April 2015 in Nagoya. 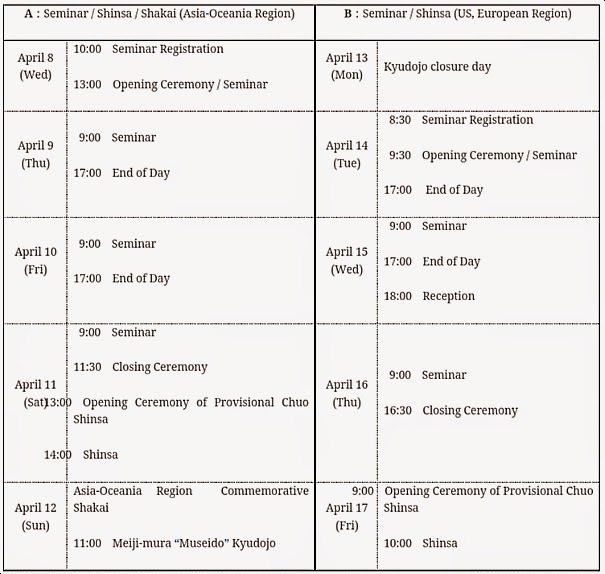 4th Asia-Oceania Kyudo Seminar and Chuo Shinsa's pre-release schedule. This time Aisa-Oceania region is in A group and will start first from 8 to 11 April. Also, the special event, Asia-Oceania Region Commemorative Shakai, is scheduled on 12 April. This is a very good chance to learn from many sensei in formal kyudojo and meet with fellow kyudoka from around the world. Ladies and gentlemen it is time to plan your trip!